Only 65 Available. Register now. 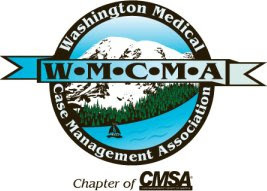 Are you a health care company or business that is interested in networking with medical case managers and other health care professionals throughout Washington? Are you looking for an effective way to let case managers learn about your products and services? Or maybe you’re a health care employer or job recruiter seeking to network with WA case managers for career opportunities. We want you to be a Partner In Case Management Exhibitor at our WMCMA Annual Fall Conference & Expo 2018. Includes one 6-foot exhibit table for your company display and admission for four (4) booth attendees and two (2) conference attendees, including lunch. Platinum recognition as an Event Sponsor and key positioning of your exhibit during the fair. Your company logo and link to your company website featured as a valued sponsor on the WMCMA website for One Year. Company name & logo on pre-event promotional materials and printed on all conference handouts. Includes one 6-foot exhibit table for your company display and admission for four (4) booth attendees to conference, including lunch. Gold level key positioning of your exhibit during the fair. Your company logo and link to your company website displayed as a valued sponsor on the WMCMA website for six months. Company name & logo on pre-event promotional materials and printed on conference schedule. Includes one 6-foot exhibit table for your company display and admission for three (3) to conference including lunch. Silver level key positioning of your exhibit table during the fair. Your company logo and link to your company website from the WMCMA website for three months. Company name and logo on pre-event promotional materials and printed on the conference schedule. Includes one 6-foot exhibit table for your company display and admission for two (2) to conference including lunch. Bronze level key positioning of your exhibit table during the fair. Your company logo and link to your company website from the WMCMA website for one month. Company name and logo on pre-event promotional materials as a valued sponsor. We have a limited number of tables for charitable nonprofit organizations to exhibit at our event at a large discount – $250 registration fee. Must be a 501 c 6 charitable organization to get this rate. Poster CEU Presentation – Free Add-on! We will be offering 1.0 CE to attendees who visit your booth and complete the poster requirements during the exhibitor portion. Check the poster presentation box on the registration page and we will follow up with you with simple instructions and answer any questions. This Free Add-On is sponsored by Retirement Connection. Retirement Connection Sponsors only at this time. Registration is required. Space is limited to 65 exhibitors so register now to ensure your spot. For more details about this event, a detailed conference schedule and to reserve your space as an exhibitor, click on the links below. ← Barbeque with a Barbeque Giveaway!